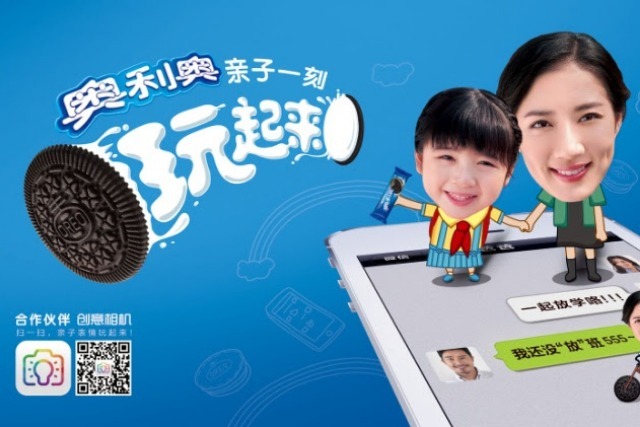 Oreo aims to bring Chinese parents who are worried about the lack of direct communication with their children, into closer contact with a custom-built Wechat app that is built around the growing "Emoji" trend. Users of the Wechat social network were invited to take pictures of themselves and their children and paste them onto Emojis, a smiley face used in Japanese web messages, which is gaining increasing popularity in China. Oreo is running the campaign on an official branded account on Wechat, a social network which lets brands build mobile apps directly into their account. The app was designed to allow users to create and share content with other users without leaving the application. Users are invited to share Emojis with family and friends, using a selection of templates and animated actions. Activity is being supported by Oreo-branded bus shelters in major Chinese cities, which allow people to project Emojis onto a big screen and print out stickers of the Emojis to take home. The campaign has resulted in more than 99 million Emojis being created in 11 weeks, with some 10 million shared with family and friends directly from Wechat.